"Love this stroller! We have five dogs but only two can walk long distances. One dog is 12 years old, one is 13 years old and one is a five year old with soft tissue problems in his legs which he was born with. I can fit all three dogs in this stroller. All three of the dogs are small dogs but there is plenty room for them. Love, love, love this stroller! It was worth the price!" "VERY SMOOTH AND QUITE ROLLING DOWN THE HALLWAY'S IN OUR APARTMENT BUILDING. AND I LOVE THE SIZE." "Even my grumpy kitty likes it!" "Westside German Shepherd Rescue of Los Angeles had their fundraiser last night. 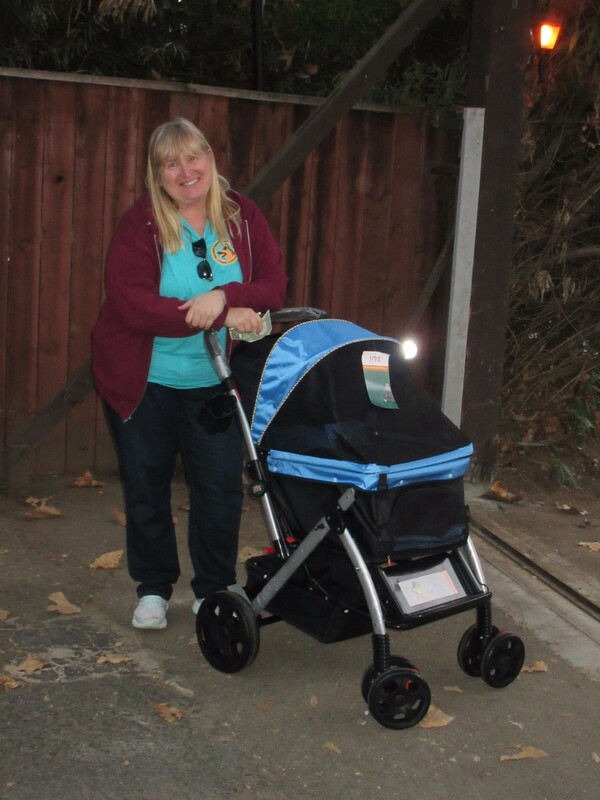 Our supporter, Vicki, walked away with the stroller Pet Rover USA donated. She is going to use it for her cats. 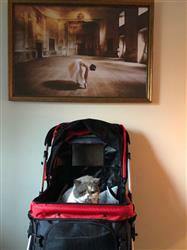 The other stroller is in our online auction and that auction is still running. 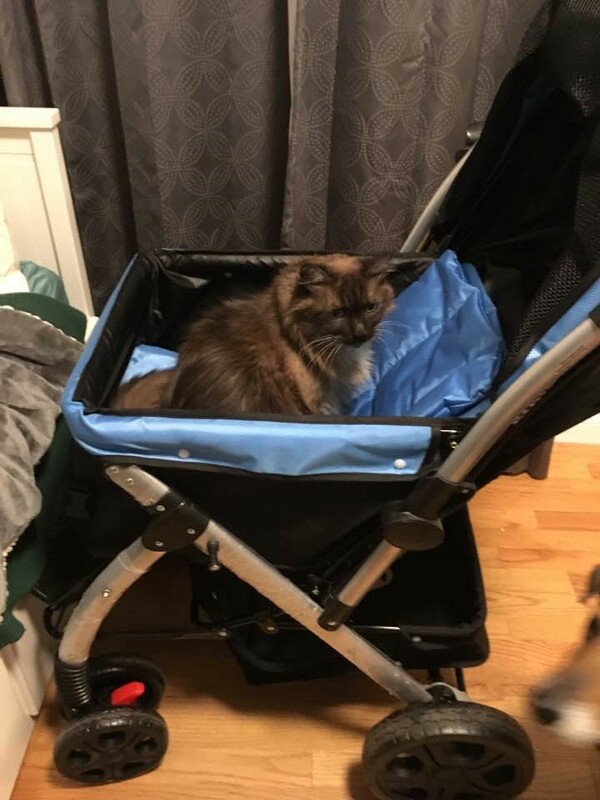 Thank you from donating them to Westside German Shepherd Rescue of Los Angeles "
"Item came as described have a few concern regarding durability and quality time will tell"
"I love love love this stroller but more importantly my two ragamuffin kittens and my 14 year old Maine **** love to be out on a walk in the stroller. 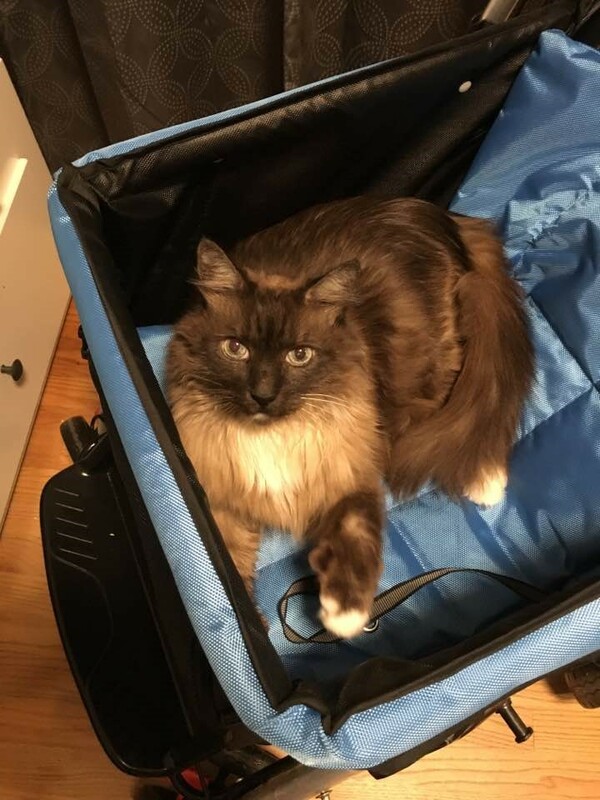 I take my kitties everywhere! 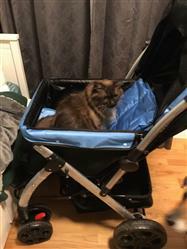 They used to be indoor kitties but now they are out and about in their stroller! I would highly recommend it! My kitties like it so much they also sleep in it in the house!!!!" "Really love going on hikes at night, this gives us a little more visibility! makes things really safe "
"Sturdy! it held up all my shopping bags, no problem!!" "Very nice bad, I like it, especially useful in the cold winter"
"It's soft and pretty thick unlike other pads i've used "
"It does what it says, really love the quality "
"Perfect for keeping everything dry!!!" "My husband had no problem putting the rover together after it arrived. It is such a well made stroller. Love everything about it. Our geriatric dog loves having a spacious and stable stroller to ride in." "They're great for shopping! " "I was very skeptical about this cover, but once I received it I took it out for a test run and it works and fits amazing!" My seniors love their warmers all year around. "These do get very warm so it is advisable to use a nice thick cover over them . Senior pets frequently won't feel the burn until damage has been done. When they cool they do get hard like a rock. In my experience these warmers do cool quicker in average indoor temps than manufacture states. I have been using the same two bed warmers for approx 60uses each and so far have had no leaks and no problems with them . Senior dogs weighing 6 to 14 pounds use them inside our home under their bed cushion." "I like this pad. It gets soft when heated and slowly hardens as it cools. My 15 year old (recently adopted) dog really likes it. I also have a plug in heating pad for him but like the safety factor of this one when I’m not home. The warmth decreases over time but lasts several hours. I will also use it when taking him out in the car this winter. I gave 4 stars because because I wish the heat lasted a little longer - really 4.5 stars. Also great for stroller use!!!" Great quality clip, leather and love the color! "What a deal! Love this little leash. Nice to have to just grab and go. I thought it would be for me and my service dog but turns out my son and his service dog use it more! Either way we are getting lots of use out of it! Nice quality clip and leather." "This is the most handsome leash I have ever bought and I have bought quite a few well made leather leather leashes. The quality and workmanship is extraordinary. It resembles a fine English bridle. It is worth every penny and then some. The traffic handle is very handy for controlling my 100 lb Rottweiler. The contrasting padding in the handle is a real bonus. I got the black with tan colored padding. Outstanding. " "Excellent quality made, beautiful desighn and color look wonderful on dog, works perfect, used both handles already. Smells great like new bridle leather. Couldn't be more pleased." "This is a gorgeous and functional, very well made leash! The quality is exceptional. So much thought went into the design and comfort (the padded loop) and it is pliable and not stiff and rigid like so many sturdy leather leashes. The hardware swivel is top quality as well. Everything about it is fantastic! I highly recommend their leather collars too! I had to exchange a leather collar o got from them for a larger size and the customer service was excellent. Great company!" "Worth it! I bought the cheap red bag before and the bag's drawstring broke. Not this one. 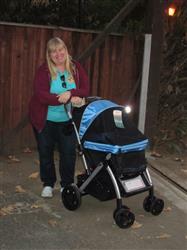 This bag material is very durable and even though the bag came back with a lot of marks on it, the stroller was intact!" "This was an awesome buy! I needed a travel bag so I could check my large stroller. Most bags seemed too small or just too expensive for what I needed it for. This bag is great! We've flown with it a few times now and it handles the tossing and throwing like a champ! The handles and straps are great quality as well. Highly recommend!" "this coupled with the fan are perfect for our hikes. I love that I can keep my dog just as hydrated as I am"
"Great to keep our babies hydrated!! we take long walks and this is perfect for them"
starsMy cat loves her bed warmer!!! "I moved my little diva cat from sunny warm Los Angeles to chilly Canada &amp; was worried about the cold. The K &amp; H bed warmer is her favorite place to be!!!! It's the perfect temperature! I have it in between a folded towel on the couch - &amp; that's where I always find her! I recommend it to anyone! The small size is good for cats &amp; small dogs. " I use this on my cats window bed. "I use this on my cats window bed. Helps keep her warm when the chill from outside comes through the window"
"Very simple to use the breeze it provides is well worth the price "
"Although I purchased several USB fans up to the present, this product is the highest level of both air volume and driving sound. It was bigger than I thought, but the battery is built in and the usability is also very good. Perfect for keeping me or Benji cool in the Miami heat"
"We bought these to use in our camper for our two small dogs (Chihuahua and Min Pin). Our camper is small, so space is at a premium. I have been trying to buy as many collapsible and space saving items as possible and these bowls were perfect. When needed, just pop them open and fill them up and we have two well-hydrated happy dogs! When leaving the campsite, we dry them out and fold them down and stow them away as they take up very little room! Great addition to the stroller "